William P. Wreden chose Austin Dobson's poem, "My Books," as the keepsake he issued to commemorate the reopening of his bookshop in 1953. 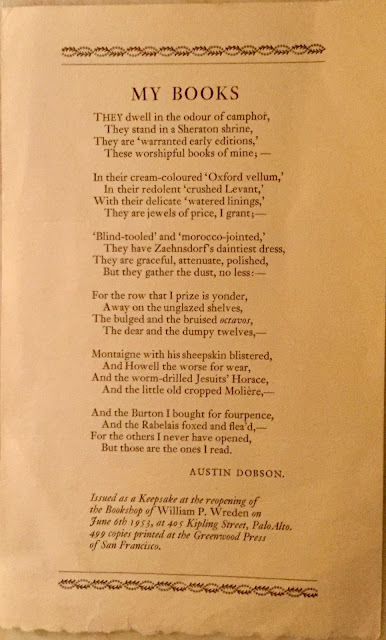 And I choose Wreden's keepsake of Dobson's poem to begin this virtual tour of my Austin Dobson Collection. The poem itself reminds me of my own library, particularly stanzas four, five, and six. 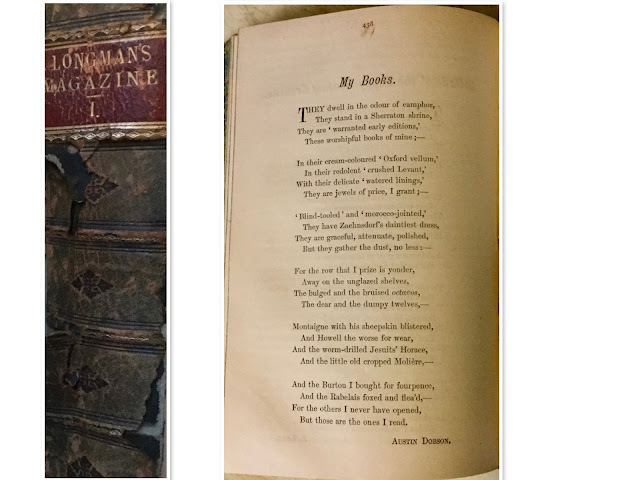 "My Books" was first published in the February 1883 issue of Longman's Magazine. 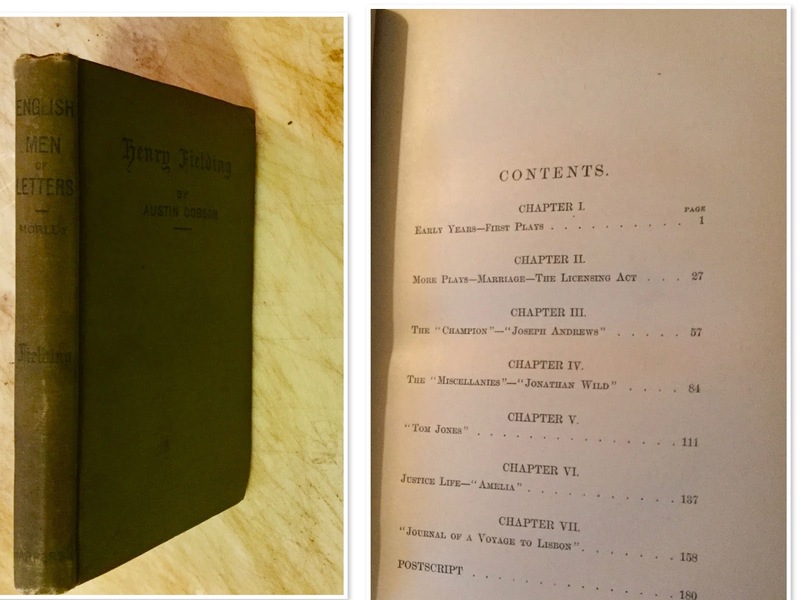 I found a copy of Longman's Magazine, Vol I November 1882 to April 1883, in a bookstore near RAF Mildenhall in the late 1980s. A Bookman's Budget, published in 1917, contains over 250 short literary pieces, some only a half-page long that Dobson either gathered from a notebook he filled during his many years of reading, or which were first published in periodicals. 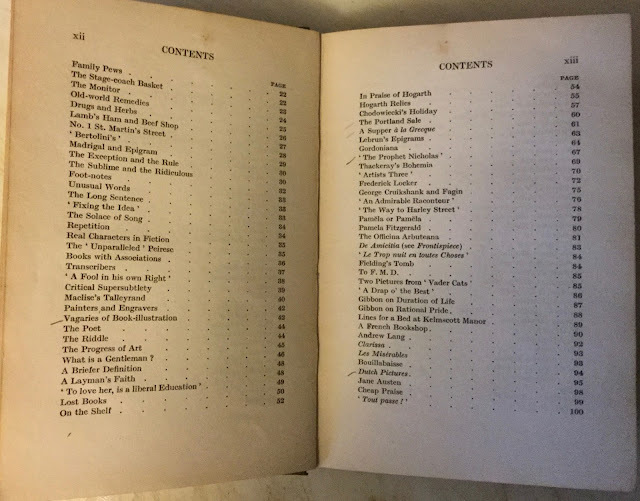 The previous owner of my copy of A Bookman's Budget marked ten pieces in the Table of Contents that were especially to his liking. If I marked what I liked, I would have marked over a hundred of them. 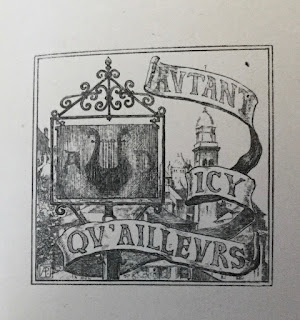 One piece in particular, about the attribution of the quotation, "O For A Booke," led me astray for more than a day, and will lead to a post on my Biblio Researching blog soon. 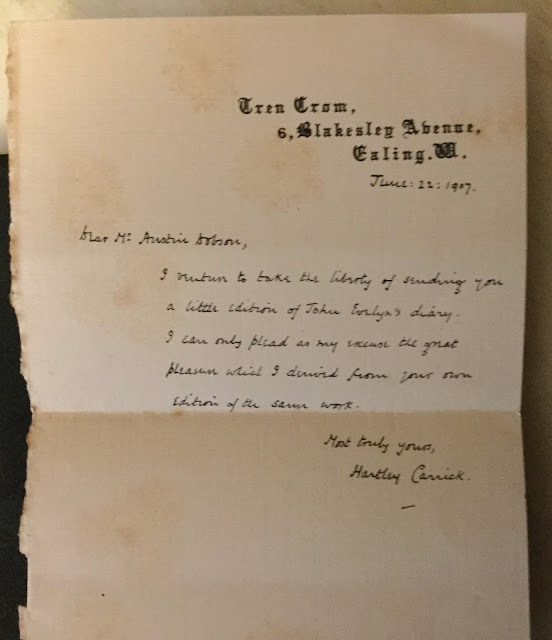 If you don't know much about Henry Austin Dobson (1840-1921), two American men of letters, William Dana Orcutt and J. Brander Matthews will introduce him to you. And he is better known as Austin Dobson. 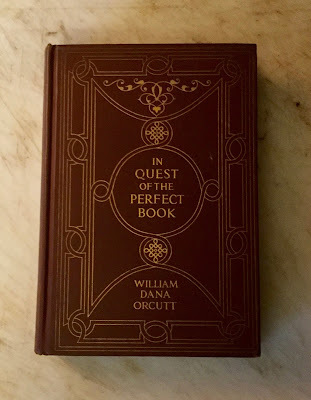 In his book, In Quest of the Perfect Book, William Dana Orcutt (1870-1953) has a section titled, "Friends Through the Pen." 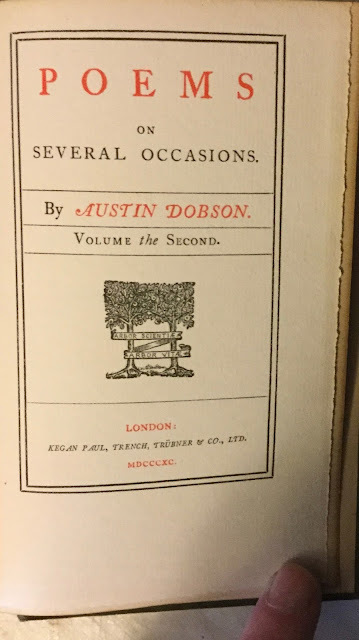 And in this section, he identifies his friend Austin Dobson as "interpreter-in-chief of the eighteenth century." Orcutt tells us that Dobson went to work as a clerk in the Board of Trade at the age of sixteen, and worked there for forty-five uneventful years, eventually becoming a principal in the Harbours Department. Orcutt found it hard to believe that this bureaucrat was the author of biographies of Fielding, Walpole, Bewick, Hogarth, as well as the poet who helped introduce England to the ballade, chante royal, rondue, triolet, and other obsolete poetical forms that he had learned from his French grandmother. 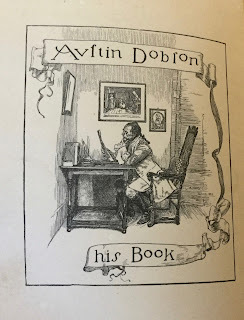 Orcutt called Dobson "the most modest literary man he ever met," and shared the following anecdote: When the English government bestowed an annuity of £1000 to him, Dobson said, " I don't know why in the world they have given me this, unless it is because I am the father of ten children. I have no doubt that would be classified under 'distinguished service to the crown." Personally, with ten kids and a full-time job, I wonder how Dobson found the time to write at all! 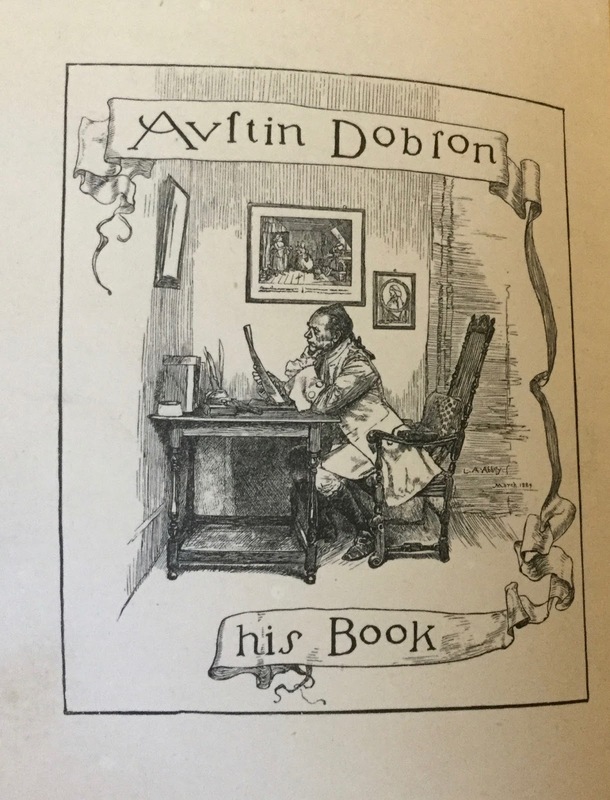 But according to Orcutt, Dobson outlined much of his writings in his head before putting pen to paper. 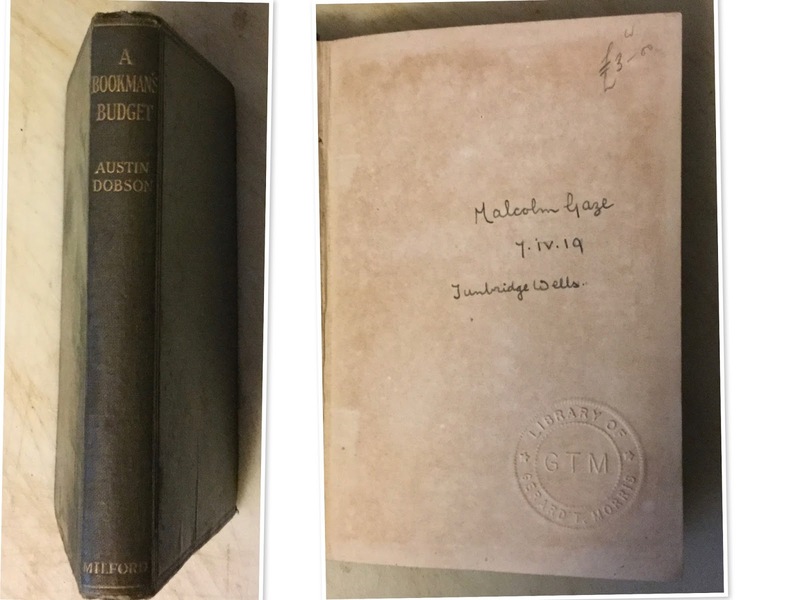 Austin Dobson was very good friends with J. Brander Matthews (1852-1929) and sent him copies of many of his books. A perusal of Dobson's inscriptions on these books recorded in The Bookshelf of Brander Matthews (books Brander Matthews bequeathed to Columbia University) begins "with the kind regards of Austin Dobson," graduates "to my friend Brander Mathews," and then finally "to my old friend Brander Matthews." Dear Brander, Give us here your fist! Arthur Penn was the pseudonym of Brander Matthews! II. Avoid slang and puns. IV. Be sparing of long words. V. Be colloquial, but not commonplace. VI. Choose the lightest and brightest of measures. VII. Let the rhymes be frequent but not forced. VIII. Let them be rigorously exact to the ear. IX. Be as witty as you like. X. Be serious by accident. XI. Be pathetic with the best discretion. XII. Never ask if the writer of these rules has observed them himself. Mr. Austin Dobson has done, perhaps as true a service as one man of letters ever did to another, by reducing what little is known of the life of Fielding from chaos to coherence, by ridding it of fable, by correcting and coordinating dates, by cross-examining tradition till it stammeringly confessed that it had no visible means of subsistence, and has thus enabled us to get some authentic glimpse of the man as he really was. 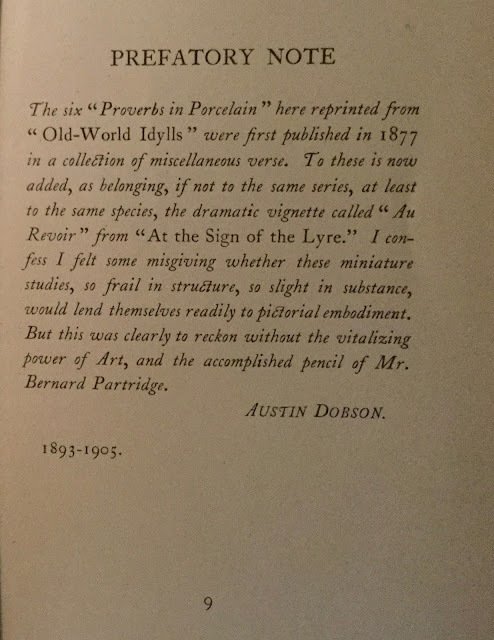 Lessing gives the title of 'Rescues' to the essays in which he strove to rehabilitate such authors as had been, in his judgment, unjustly treated by their contemporaries, and Mr. Dobson's essay deserves to be reckoned in the same category. 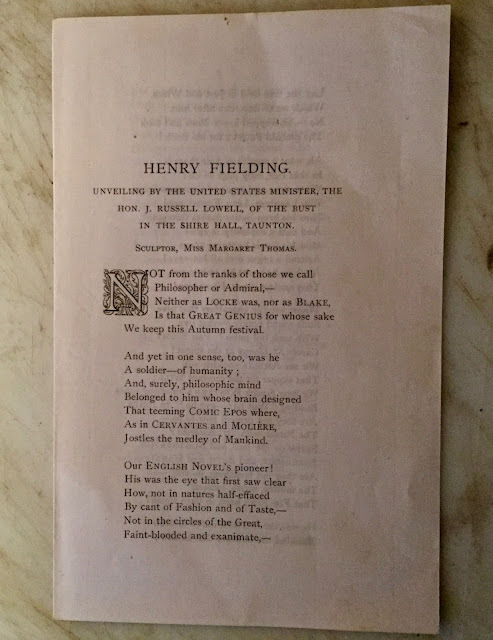 He has rescued the body of Henry Fielding from beneath the swinish hoofs which were trampling it as once they trampled the Knight of La Mancha, whom Fielding so heartily admired. Coincidentally, the newest addition to my Austin Dobson Collection is a keepsake of Dobson's poem on Fielding commemorating the unveiling of the bust of Fielding at Shire Hall, Taunton in 1883.. This keepsake is a magnanimous gift from my Australian friend, the Johnsonian John W. Byrne. Come to find out John collects Austin Dobson as well (and books about books for that matter). 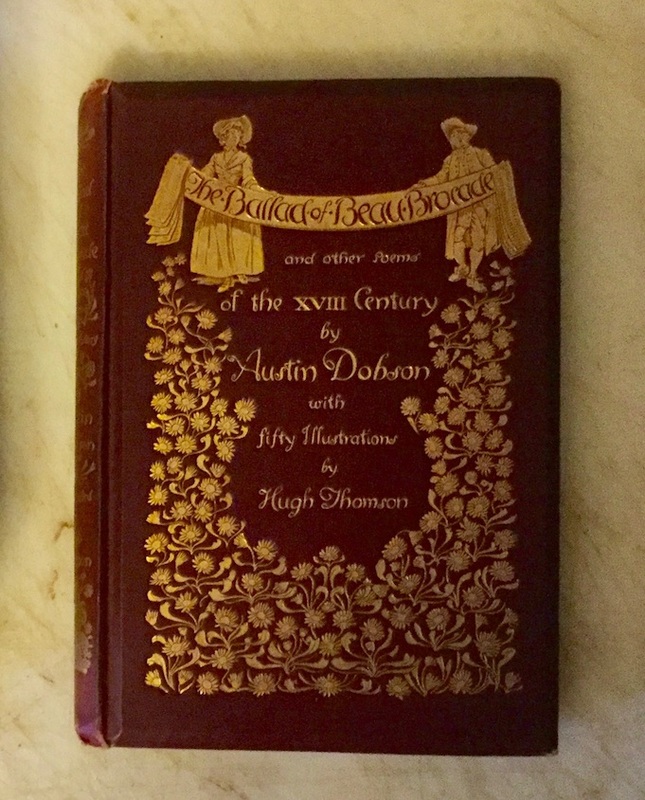 He acquired several copies of this Dobson keepsake from Austin Dobson's granddaughter Rosemary Dobson, who acquired them from her uncle Alban Dobson. It was Austin Dobson's poetry that first made him popular both in England and in America. But I enjoy reading his prose works even more. And that's what I first started collecting. 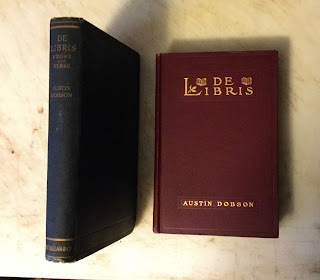 Then I bought not one, but two bibliographies of Dobson's works. And soon I was collecting his poetry as well. I have the Burt Franklin 1968 reprint of A Bibliography of Austin Dobson by Francis Edwin Murray, which was published in 1900. 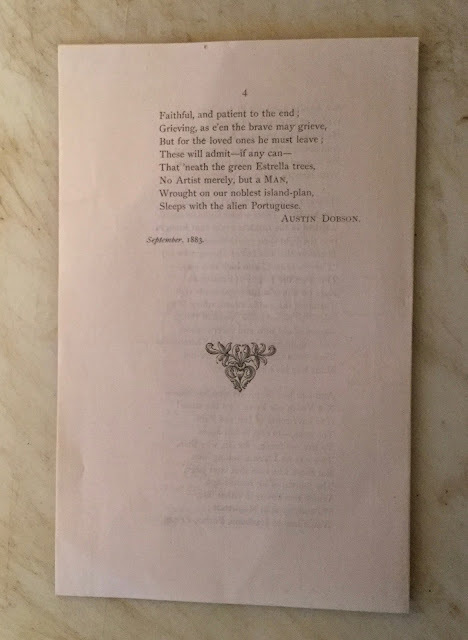 And I have the 1970 Burt Franklin reprint of A Bibliography of the First Editions of Published and Privately Printed Books and Pamphlets By Austin Dobson which was compiled by his youngest son Alban Dobson and published in 1925. 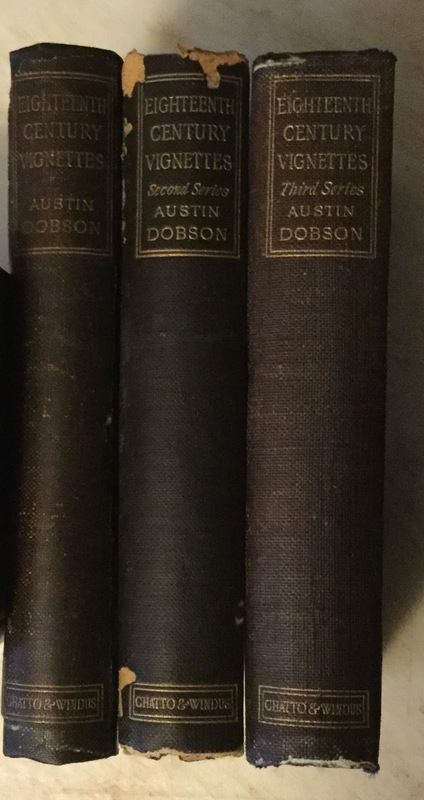 I recommend that the Austin Dobson collector acquire both bibliographies as each has its own advantages over the other. Murray's bibliography is the more comprehensive of the two. 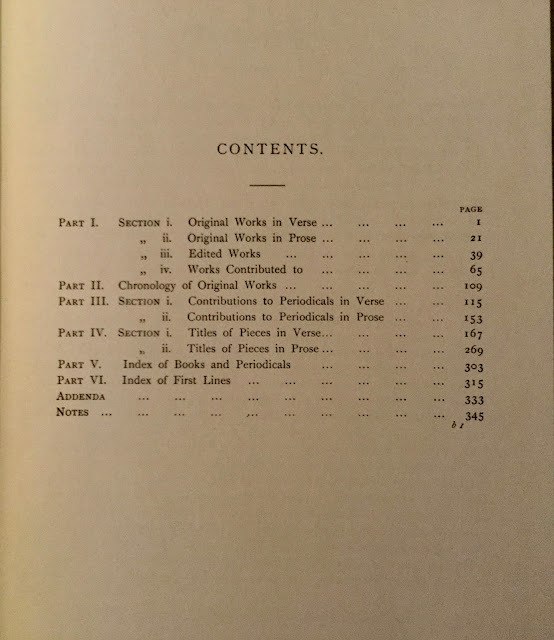 It separates Dobson's works in prose from his works in verse; lists later editions; provides a list of works Dobson either edited or translated, with memoirs, prefaces, and introductions; and includes a plethora of information concerning the first appearance of many of the prose and verse works in periodicals. 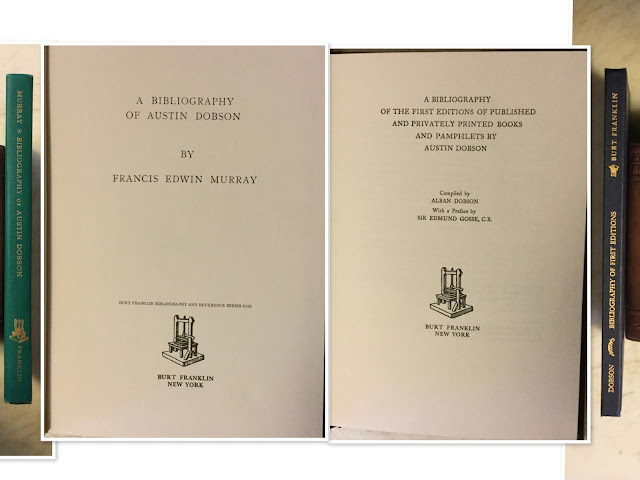 The disadvantage of having only the Murray bibliography is that it only covers works up to 1899. Alban Dobson's bibliography, published thirteen years after his father's death is the more updated bibliography of the two. 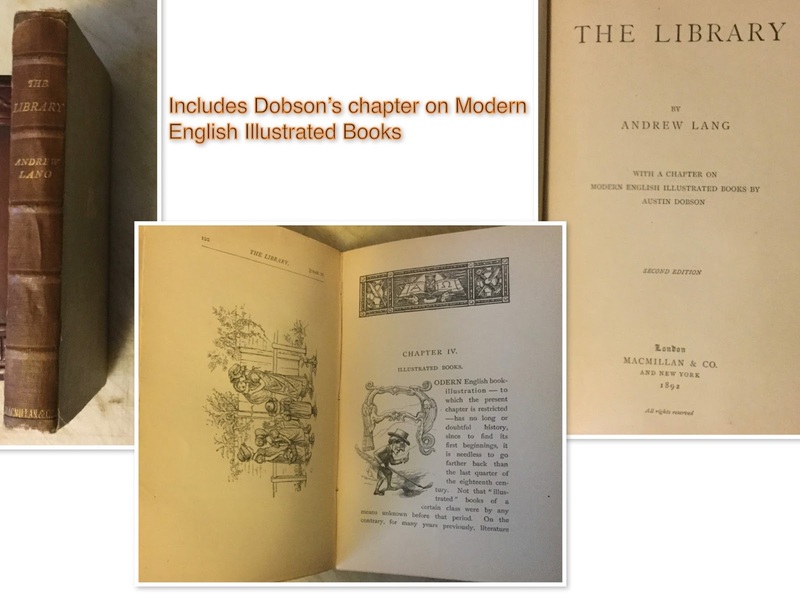 It lists all of Dobson's first editions in chronological order, and includes print runs. 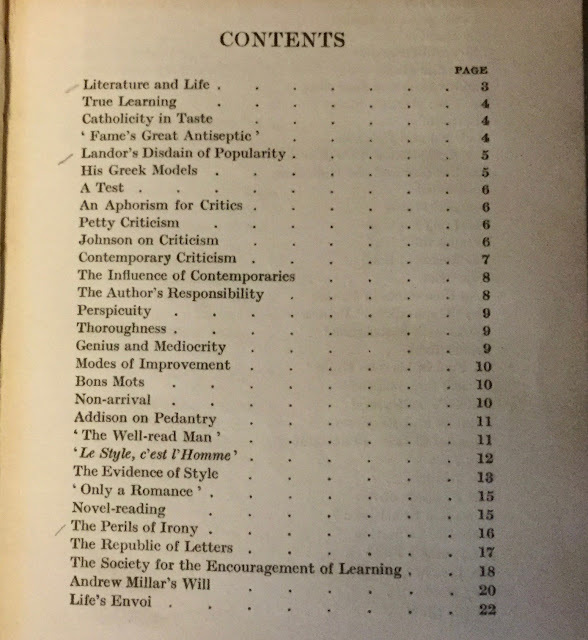 But it doesn't contain all the extra good old stuff that's included in the Murray bibliography. Although not a bibliography, another reference book I recommend is A Catalogue of the Collection of the Works of Austin Dobson by the University of London, 1960. Alban Dobson helped create this catalogue, primarily from the books formerly owned by Austin Dobson that the Dobson Family donated to the University of London. In essence it is only a checklist, but it strives to list all the editions of Dobson's works. 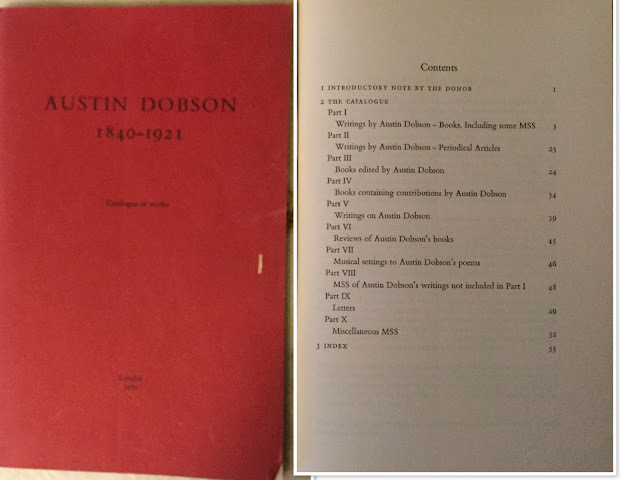 Of special interest to me is the list of books and periodicals containing the writings by other authors about Austin Dobson. Orcutt's In Quest of the Perfect Book And Matthews's Pen and Ink are two of the sources identified. Now that I've identified the Dobson reference sources in my library, I will display the books by Dobson that I have in my library. And I will begin with his prose works. 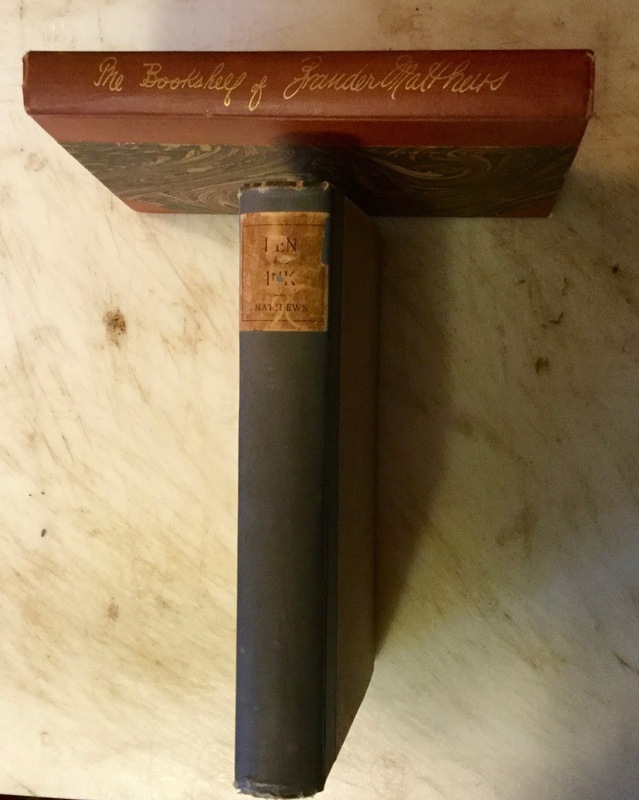 This is the book that James Russell Lowell raved about at the unveiling of Fielding's bust. 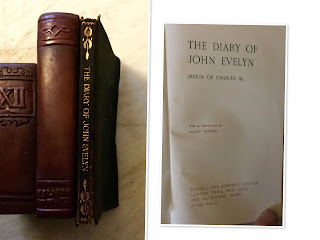 It was first published in 1883 in London and New York, and is part of the English Men of Letters Series. 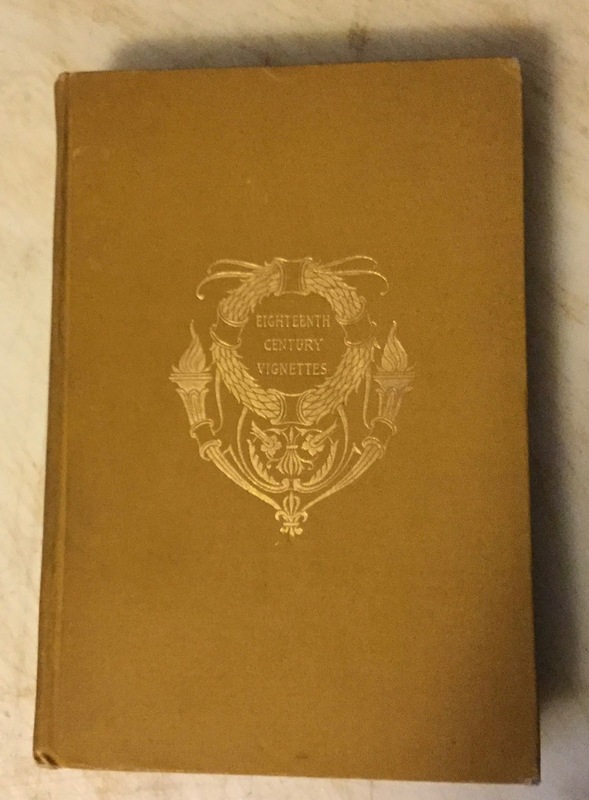 My copy is a Harper Brothers reprint of the 1883 edition (no date on the title page). 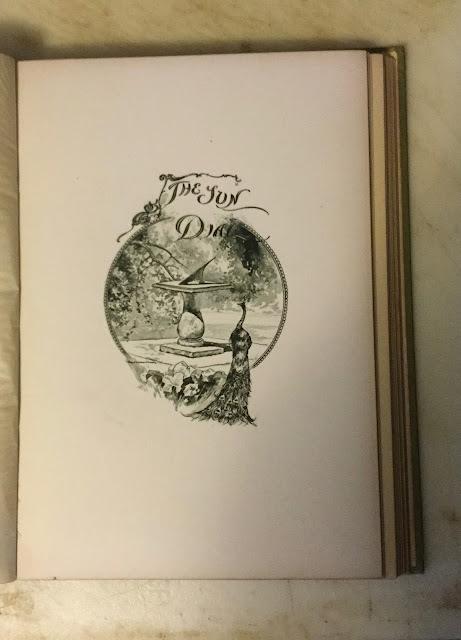 Mr. Dobson's high appreciation of Bewick, and his innate love of art, together with his literary power, combine to make his book an extremely pleasant one for the reader. HIs command of language never leads him either into prosiness or into fine writing. He has access to the best sources of information now available, and gives us many facts not previously known. Mr. Dobson's little volume is not only pleasant reading, but will be of great use to the collector and the student, as it affords much assistance in identifying the engravers. –Saturday Review. 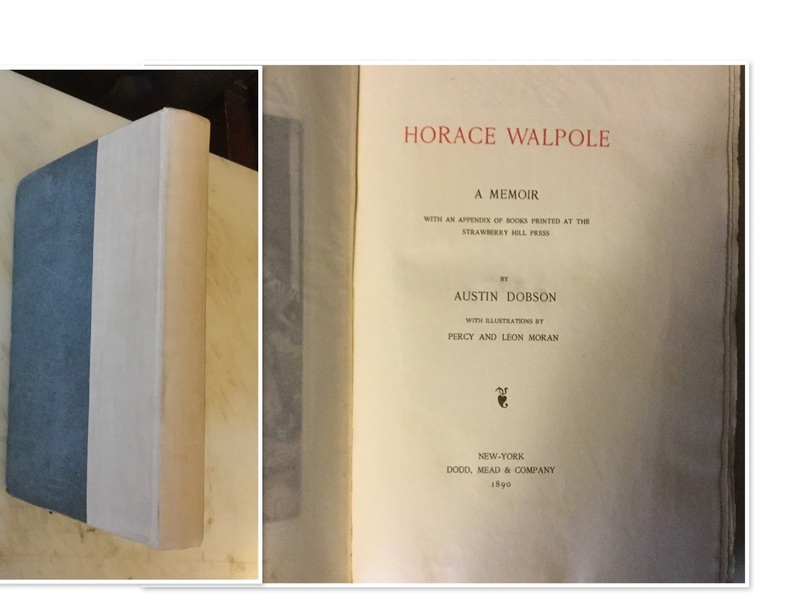 I already had Mary Hyde's set of the Letters of Horace Walpole in my library, so when I saw a copy of Dobson's Memoir of Horace Walpole in Brendan Strasser's Saucony Bookshop in Kutztown, Pa in June 2015, I had to have it My copy is No. 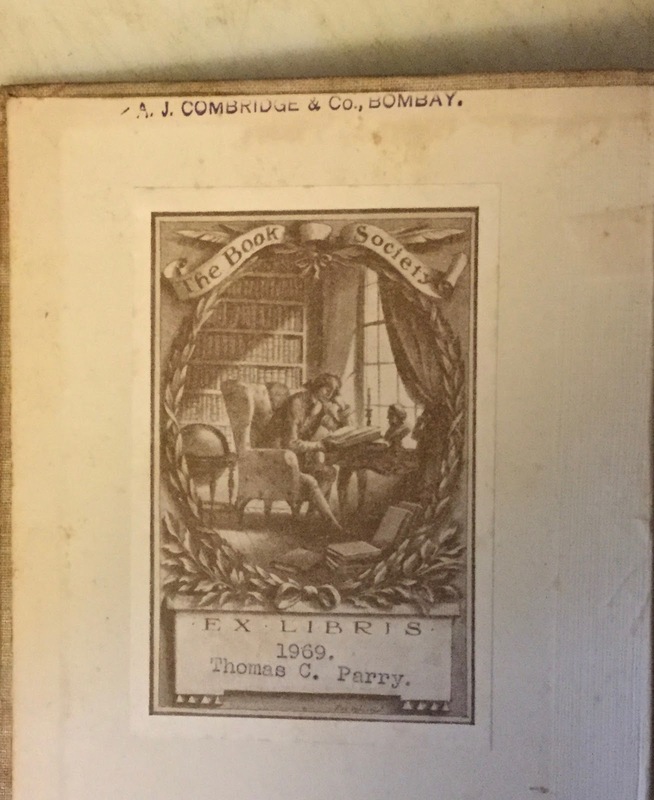 182 of 425 copies printed by Theodore De Vinne. A former owner rebacked the spine without creating a title label ( I created a paper label after snapping this photo). The cloth cover is badly soiled but the engravings inside the book just leave me speechless! 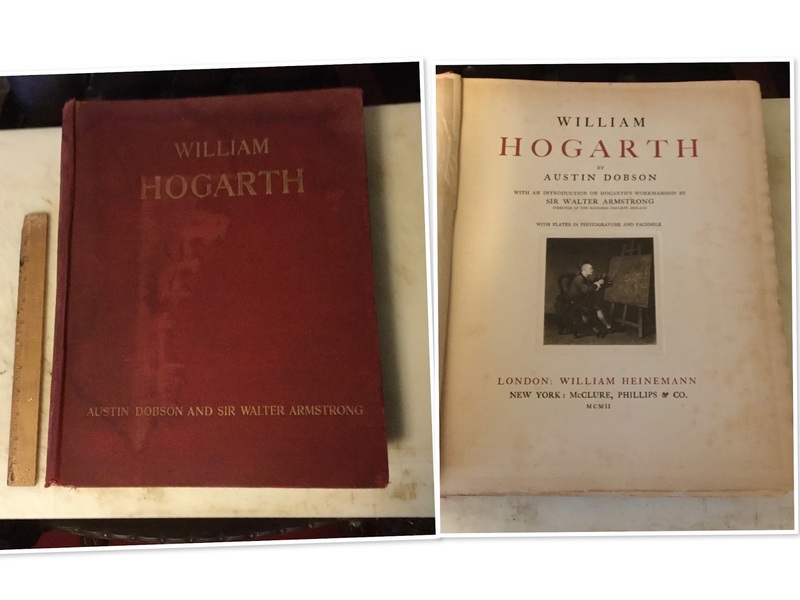 Dobson's Hogarth was quite popular. 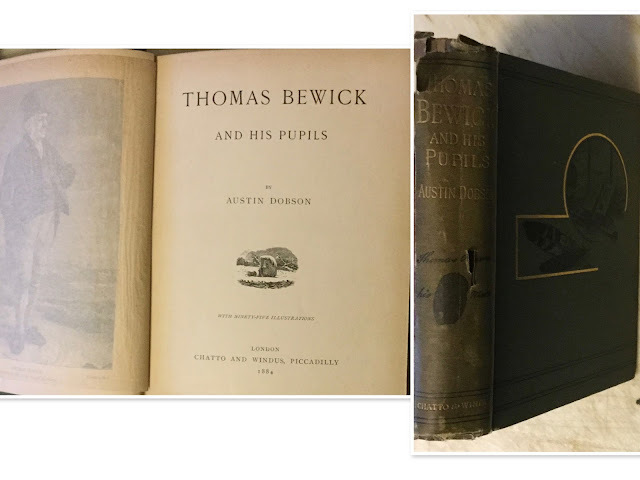 Three editions were published in octavo as part of The Great Artists Series by Sampson Low, Marston, Searle & Rivington in 1879, 1883, and 1890, and reprinted in 1894. Kegan, Paul, Trench, Trubner & Co. published an expanded edition in 1898. 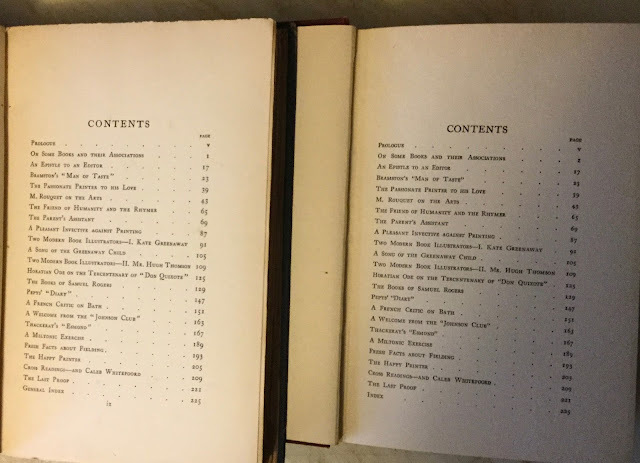 Alban Dobson says the 1898 edition formed the basis for the large quarto (sic) edition by Heinemann in 1902 (At 15 1/2 inches I'd call Heinemann's edition a folio). Andrew Lang's The Library was first published in 1881. A nine-page postscript was added to the 1892 edition to update Dobson's chapter on illustrated books. A former owner acquired this copy of the book in Bombay, India. And this book has my blind stamp in it as well. 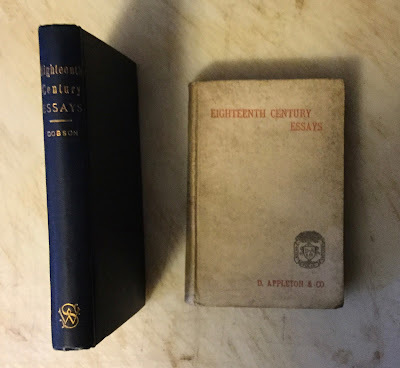 Here are Dobson's essays that I enjoy reading the most: Eighteenth Century Vignettes, published in 1892, 1894, and 1896 respectively. 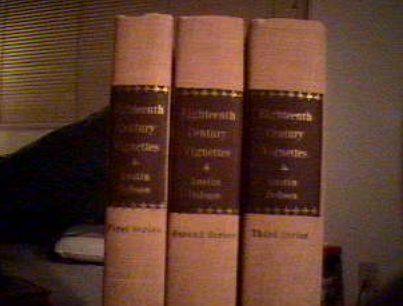 I have all three volumes of the London edition, and the third volume of the 1896 New York edition. 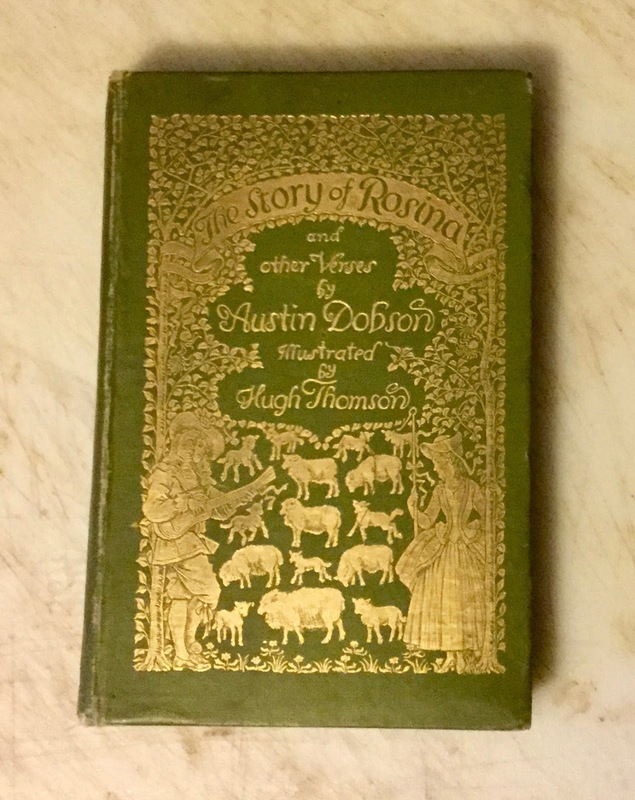 At one time I had the 1968 reprint of the New York edition. But I either sold it or gave it to another book collector. The previous owner of the London edition, the American writer Warwick James Price (1870-1933), marked his favorite pieces in the Table of Contents. And his choices are more to my liking, particularly the essays about libraries. 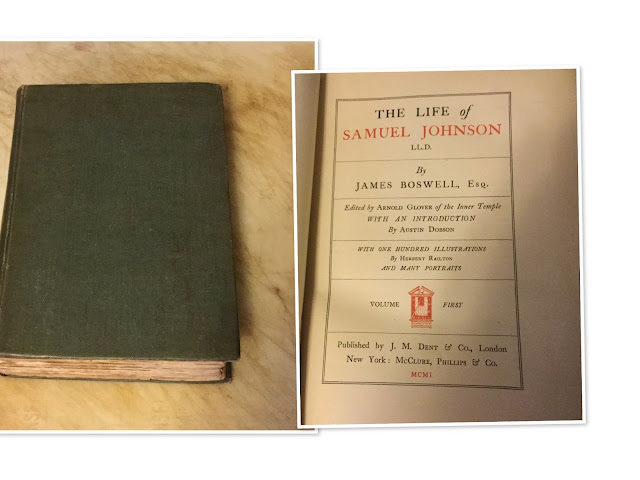 Dobson's essay on Johnson's Library was a helpful source for me in cataloguing Samuel Johnson's library on Library Thing in 2008. 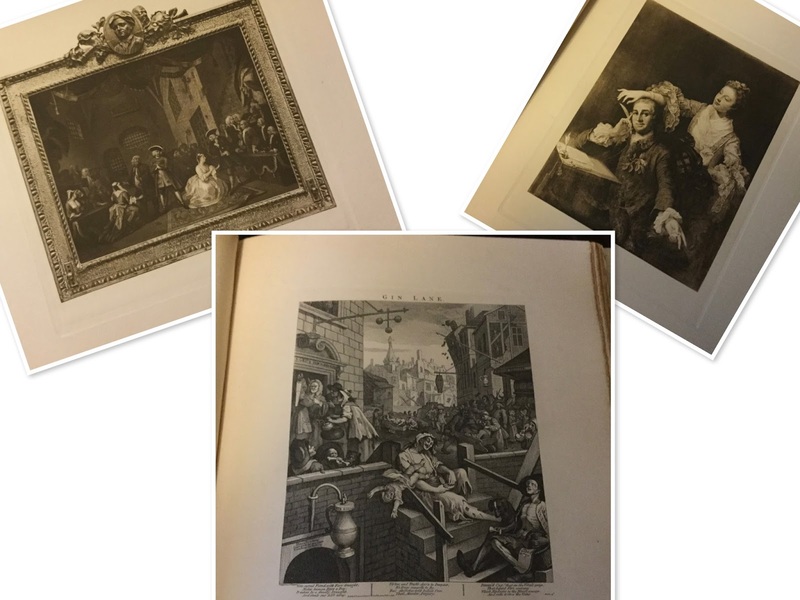 Dobson identified books belonging to Johnson that were not identified in the 1785 auction catalogue. 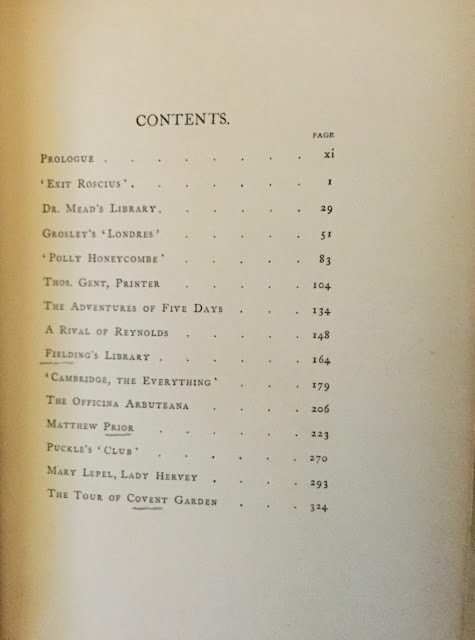 Three essays from Eighteenth Century Vignettes, Dr. Mead's Library, Fielding's Library, and Puckle's Club, were previously published in Bibliographica: Papers on Books and Their History, 1895, 1896. In 1898, Dodd, Mead and Company published Dobson's Miscellanies. Of particular interest to me was Dobson's essay, "Boswell's Predecessors and Editors." 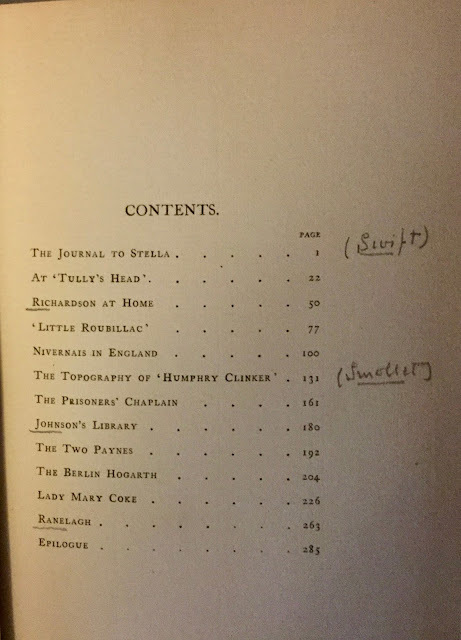 This piece first appeared in the Oct 1888 issue of Church Quarterly Review under the title "Boswell and His Editors." 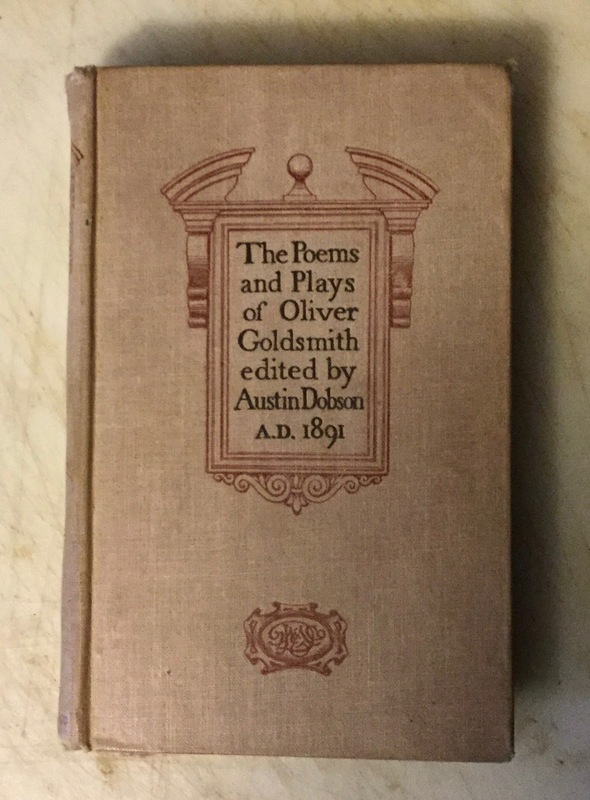 Here's a book of The Poems and Plays of Oliver Goldsmith edited by Austin Dobson and published by J. M. Dent, London in 1891. 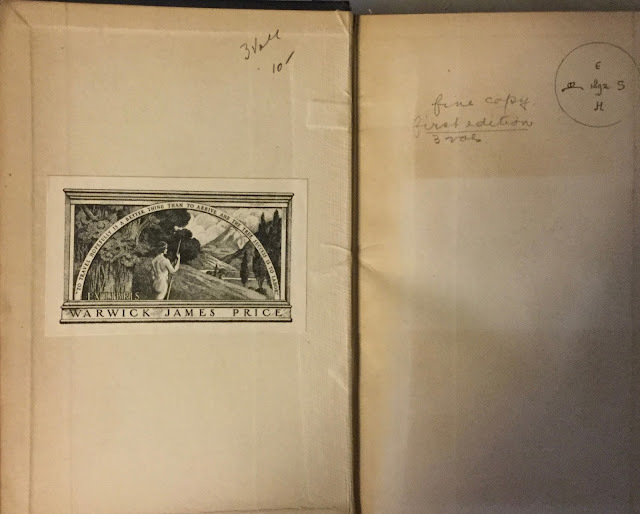 I was mesmerized by the bookplate pasted in this book. 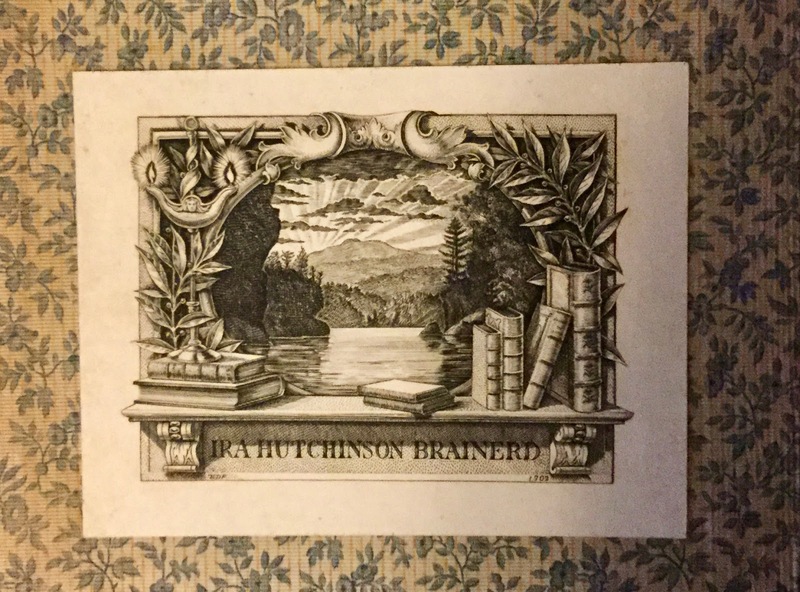 It was engraved by EDF (Edwin David French) in 1902 for the owner of the book, Ira Hutchinson Brainerd, a member of the Grolier Club. 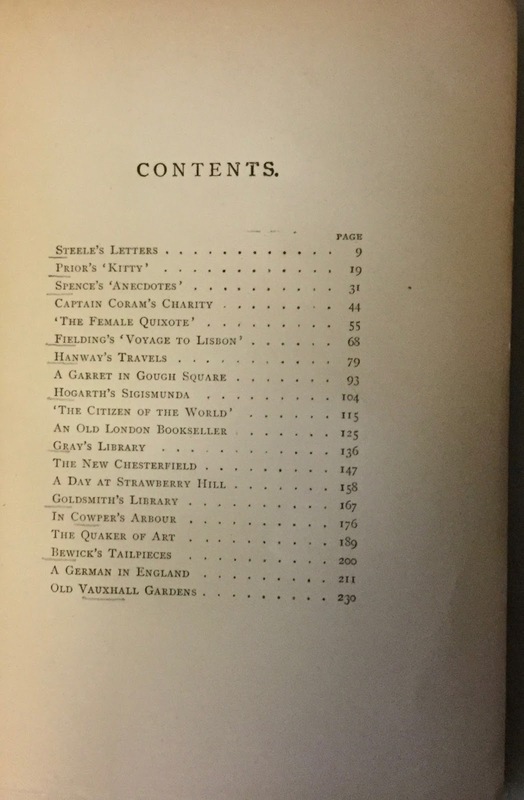 Brainerd later became the author of a memorial book about French that was privately printed by the DeVinne Press in 1908. In the Introduction to the 1901 J.M. 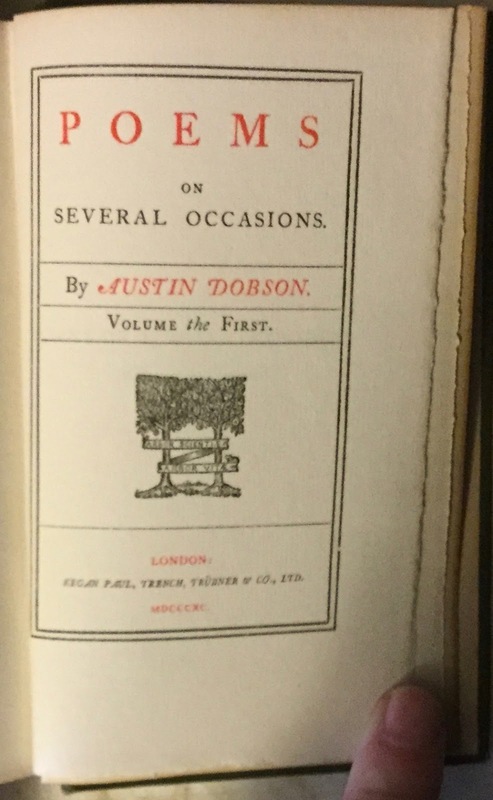 Dent/McClure, Phillips edition of Boswell's Life of Samuel Johnson, Austin Dobson writes about the London haunts and homes of Samuel Johnson. And the endpapers display a map of London during Johnson's time. 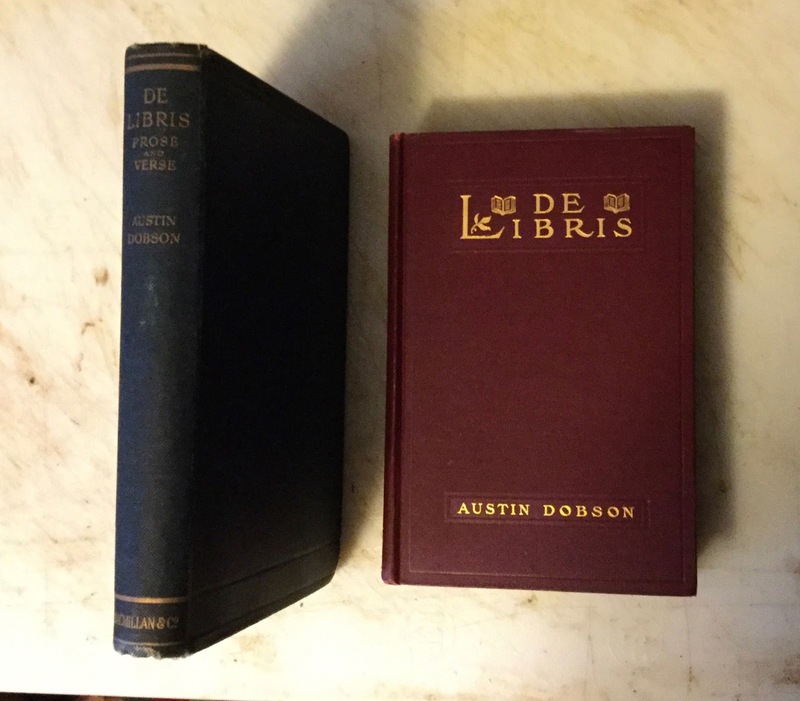 In 1908 Macmillan published the First English Edition and the First American Edition of De Libris. 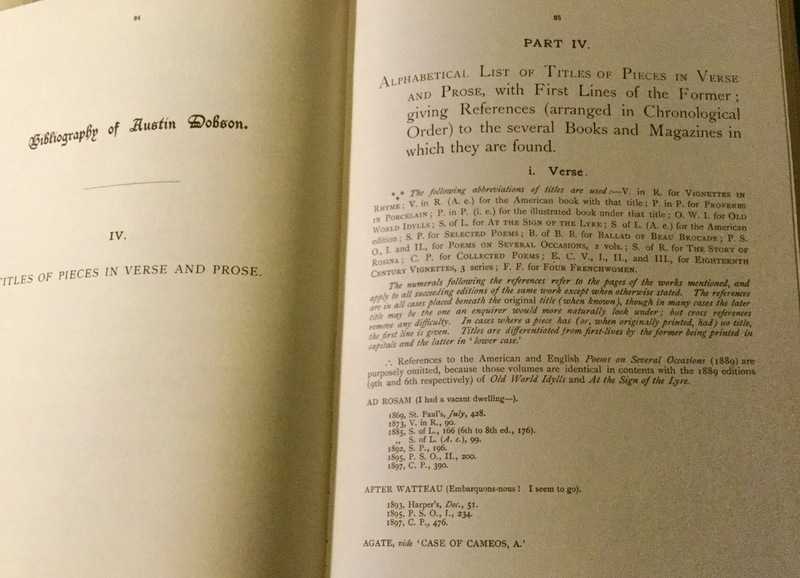 The contents of both editions were identical: eleven works of prose and eleven works of verse. 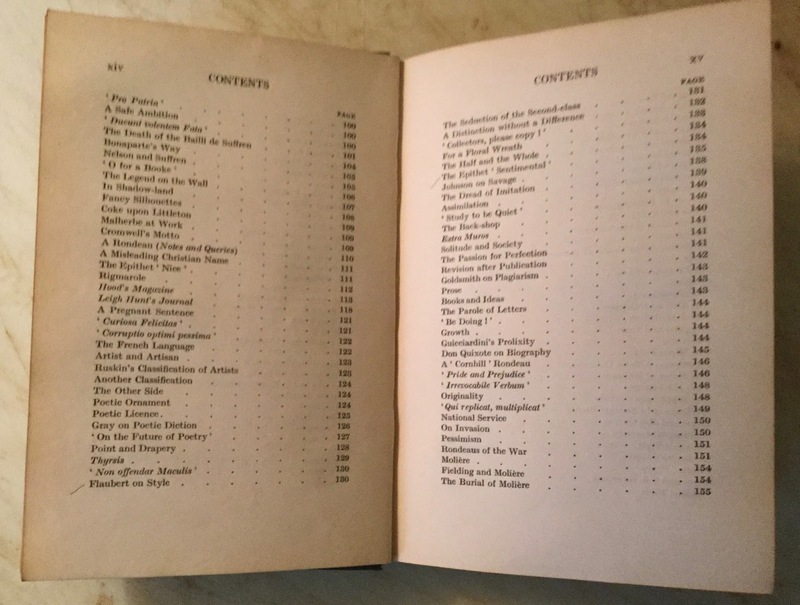 I mention this because the contents of the American and English editions of an author's book were frequently different. A second edition of the English issue, published in 1909, contained one additional essay. 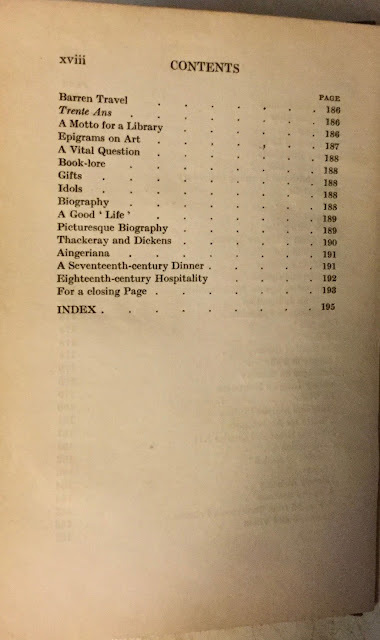 The best essay in the lot that I like is the first: "On Some Books and Their Associations." 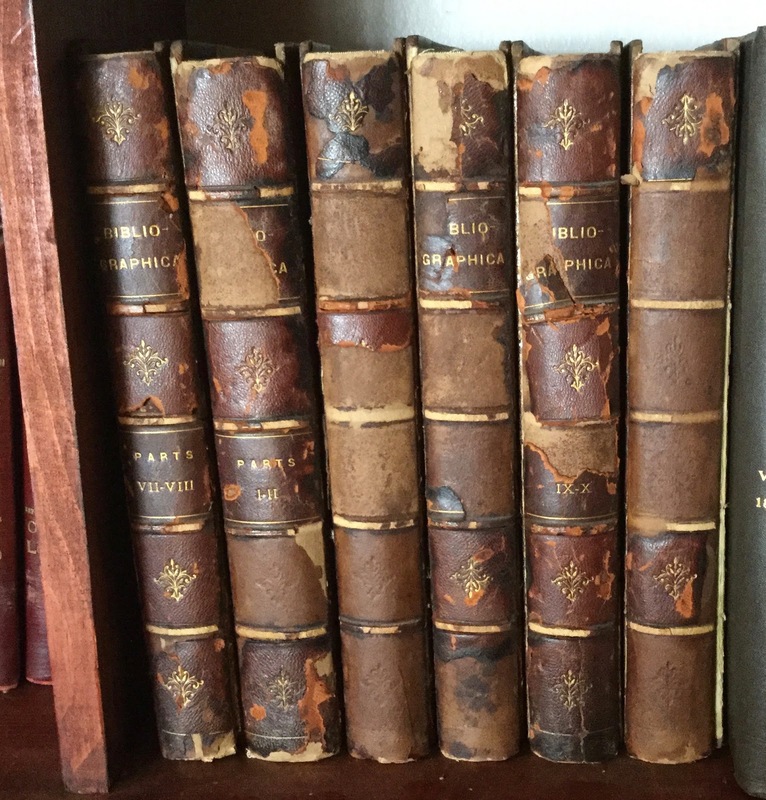 Here Dobson writes about some of the association copies in his own library. An excellent read! 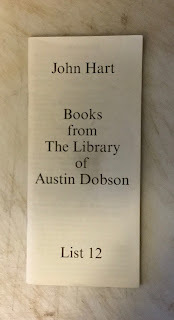 I have one book formerly owned by Austin Dobson in my own library. And it came with an ALS to him. My London friend, Sandy Malcolm, acquired it for me from John Hart. 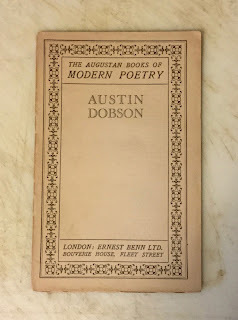 I deliberately displayed and discussed Austin Dobson's books of prose first because reading about Dobson's books of poetry could very well make you dizzy. It is a veritable maze. 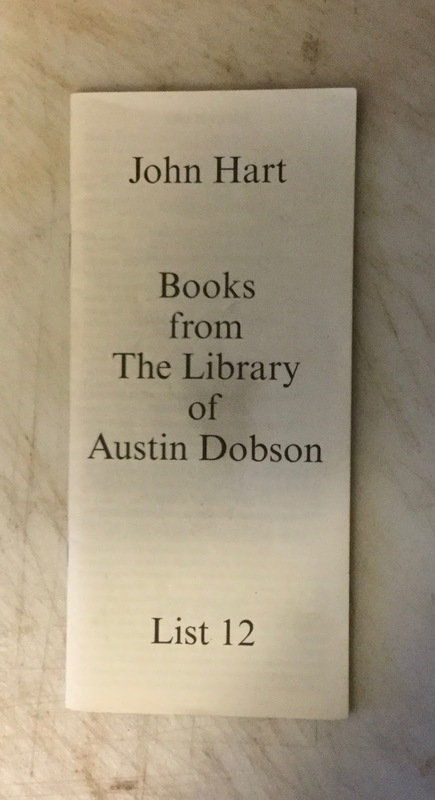 There appears to be no rhyme or reason to the publication of Austin Dobson's poetry books. 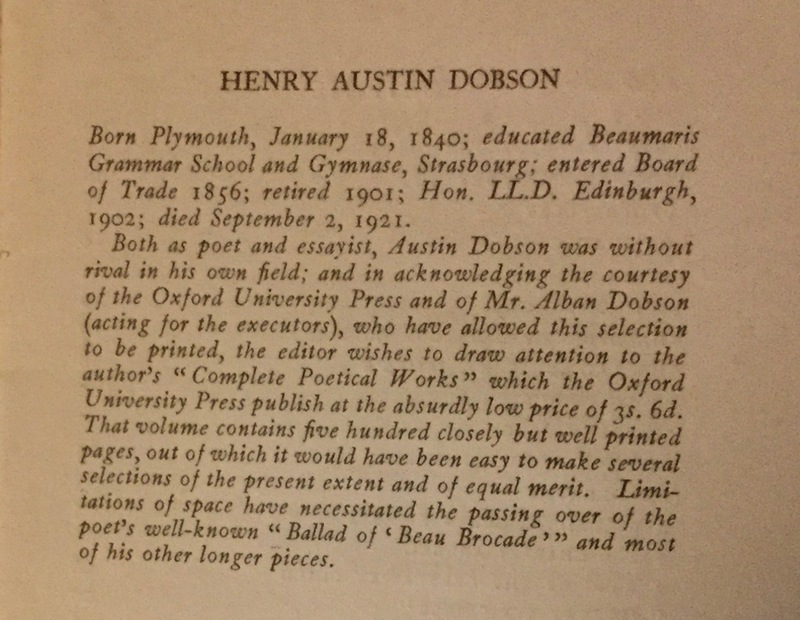 True, Dobson's poetry was quite popular. And his poetry books quickly went out of print. But too many of Dobson's poetry books contain poems previously printed in earlier books. To better understand what I'm talking about, let's track the publication of two poems, one of which you're already familiar with. 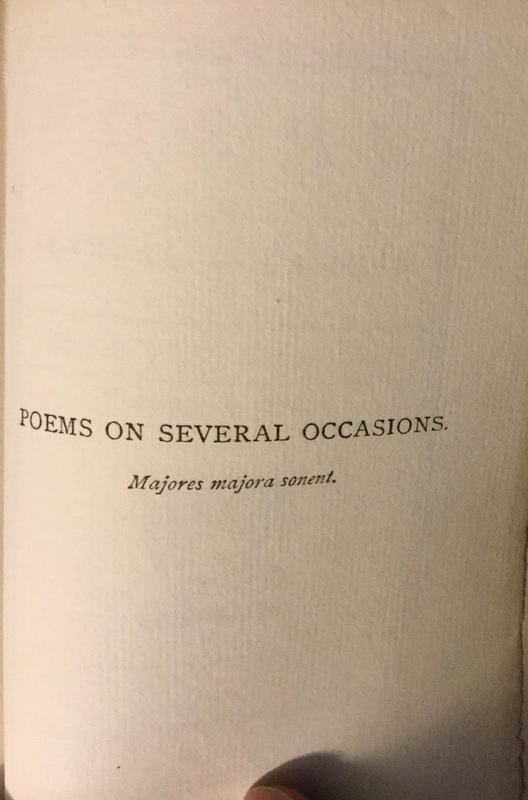 And to track the poems, we will begin with Section IV of Murrays bibliography. 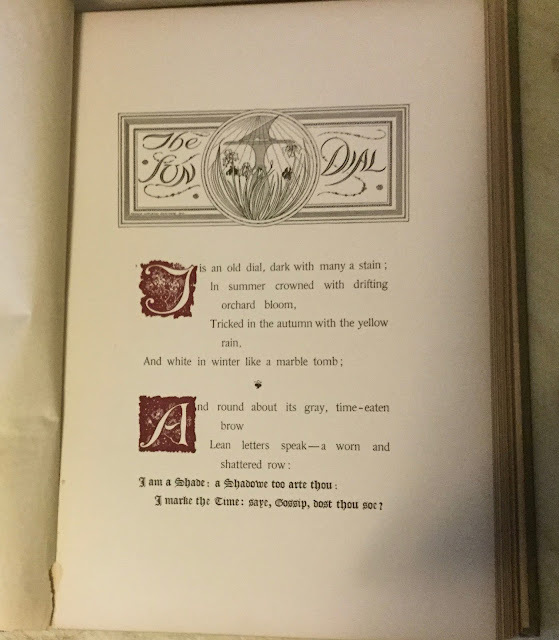 The poem, AD ROSAM, was first printed in St Paul's Magazine in 1869, was first printed in a book in 1873 in Vignettes In Rhyme, was included in the 1885 English and American editions of At the Sign of the Lyre, and was also included in Selected Poems in 1892, in Poems on Several Occasions in 1895, and in Collected Poems in 1897. 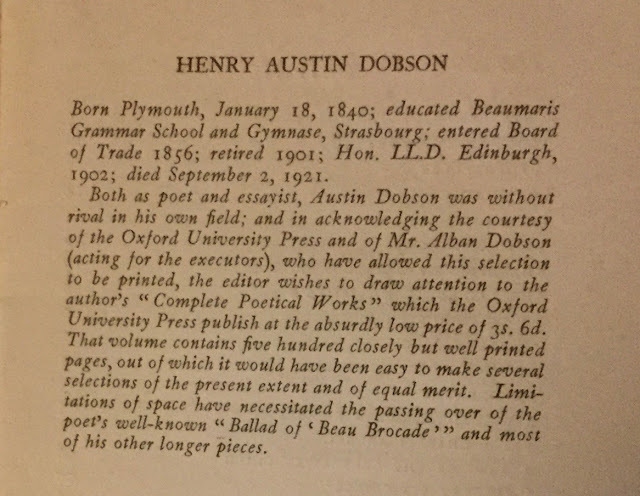 And after Dobson's death, it also appeared in 1923 in The Complete Poetical Works of Austin Dobson. 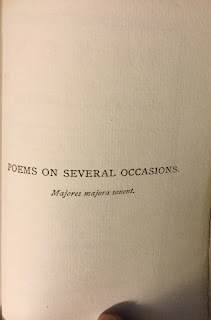 The poem, MY BOOKS, was first printed in Longman's Magazine in 1883, and was included in At the Sign of the Lyre in 1885, in Selected Poems in 1892, in Poems on Several Occasions in 1895, in Collected Poems in 1897, and in The Complete Poetical Works of Austin Dobson in 1923. Alexander Ireland added the last three stanzas of the poem to his 1884 edition of The Book-Lover's Enchiridion. 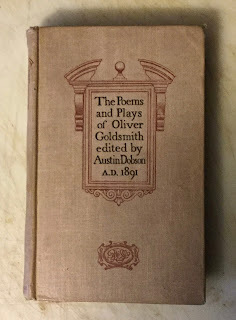 The poem also appeared in Ballads of Books in 1887 and 1888, and in Book Song in 1893. Vignettes In Rhyme, published in London in 1873, is most likely the earliest published Austin Dobson book that a collector can acquire. 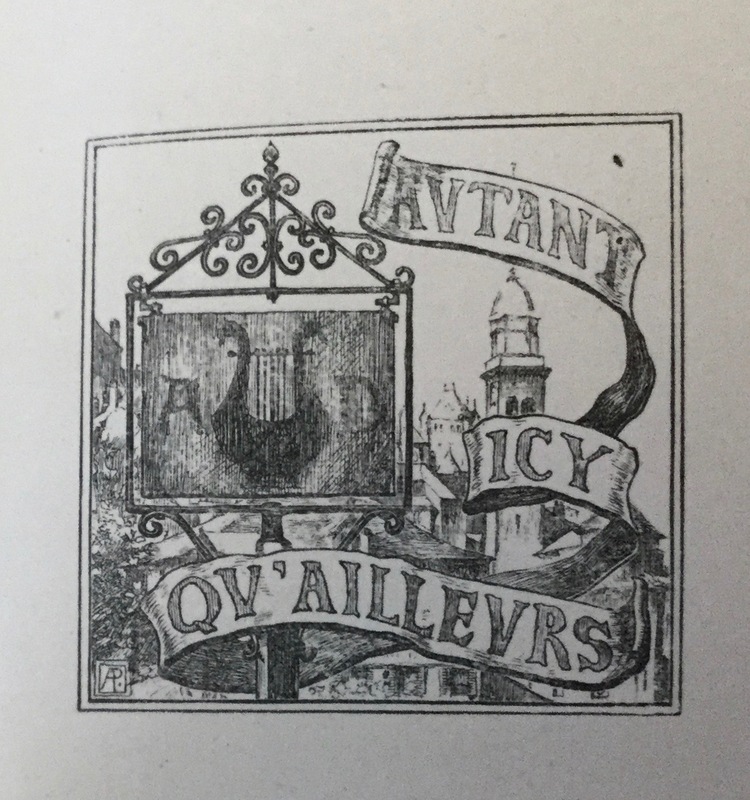 A private printing of a Statement Concerning the Drama of the Doctor's Window was published in 1872, but only 30 copies were printed. And the Dobson Family reportedly recovered all available copies. Austin Dobson dedicated the English edition of Vignettes In Rhyme to Anthony Trollope, editor of St. Paul's Magazine, who provided an audience for Dobson's poems in the late 1860s. 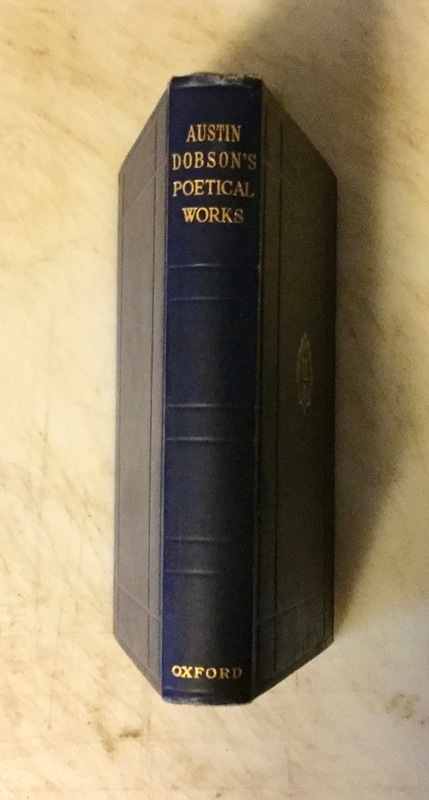 All but one of the poems collected in this book were first published in periodicals, many of which first appeared in St. Paul's Magazine. My copy of this book was formerly owned by John Taylor Bottomley (1869-1925), a prominent Boston surgeon who pasted his bookplate in the book. The book was later acquired by the venerable Goodspeed's Book Shop, and sold to William Chambers Parke (1901-1984) of the Parke Warehousing firm in 1967. 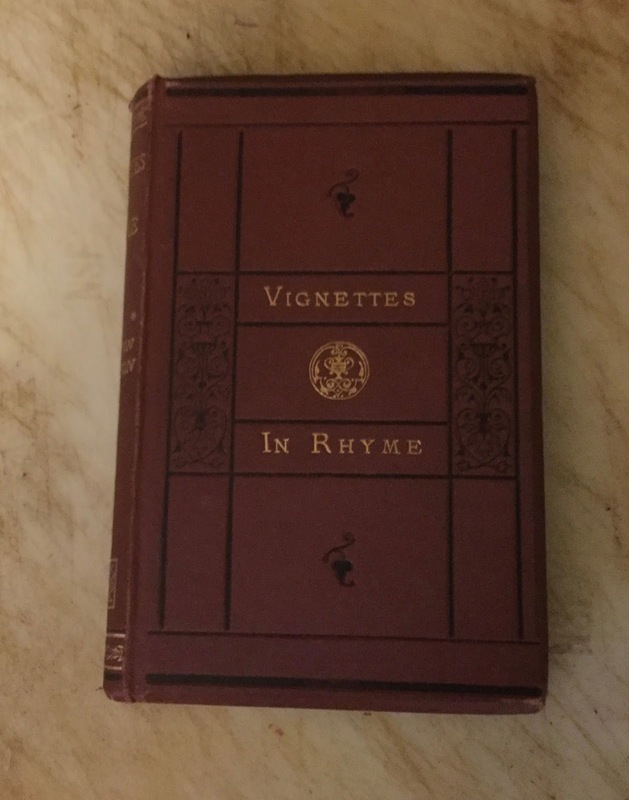 The First American Edition of Vignettes In Rhyme wasn't published until 1880. And it was dedicated to Professor Oliver Wendell Holmes. But the First American Edition was significantly different than the First English Edition of Vignettes of Rhyme. 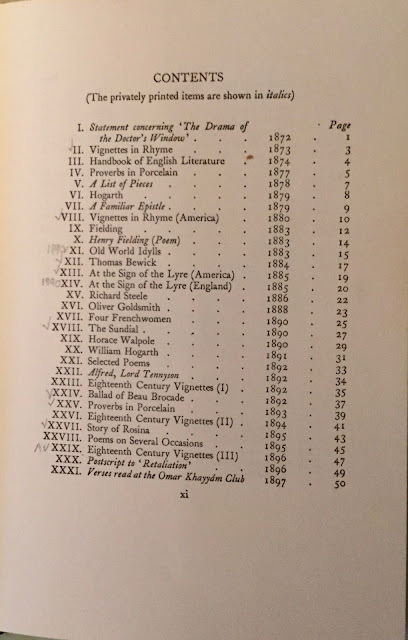 It contained 81 poems compared to the 42 poems in the First English Edition. 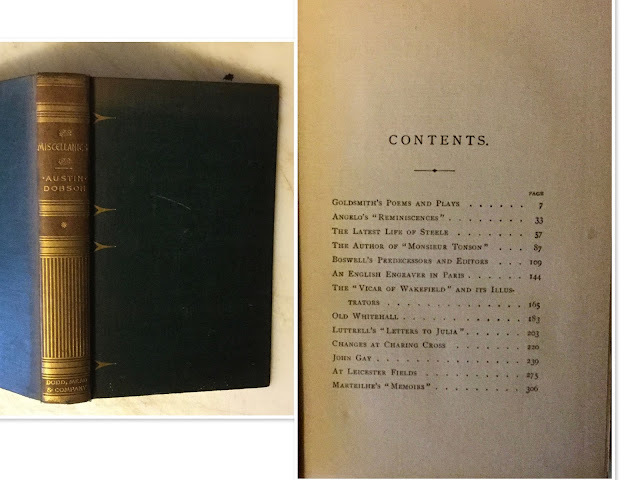 And some of the poems came from Proverbs in Porcelain, first published in England in 1877 and reprinted in 1878 (There was no publication of an American edition of Provers of Porcelain). 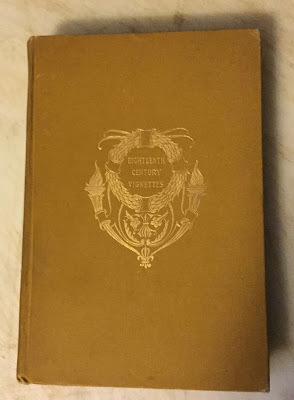 I have a later edition of Proverbs of Porcelain, the 1905 English edition. While the 1877 edition contains 45 poems, the 1905 edition only contains only seven poems. 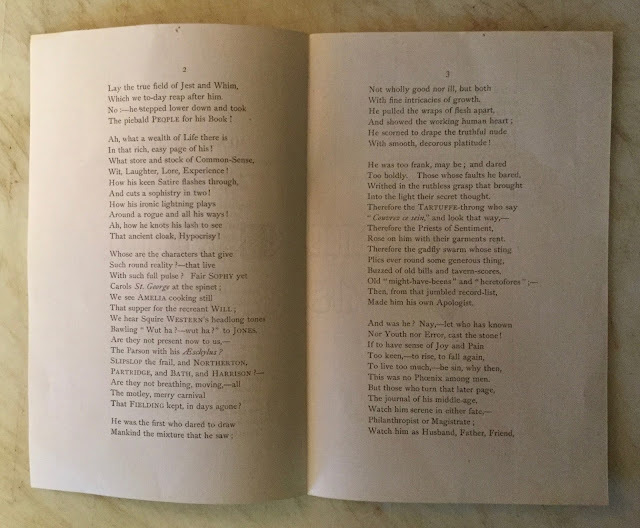 And six of these Proverbs in Procelain poems were reprinted earlier in another Dobson book of poems, Old-World Idylls. I have two copies of the 1890 tenth edition of Old-World Idylls, for a reason which I'll explain shortly. 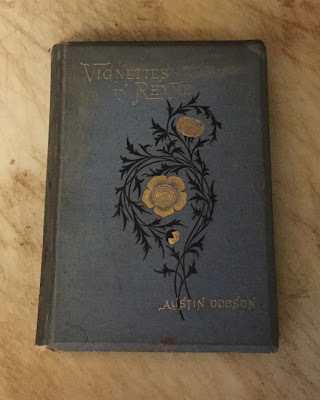 This book was first published in 1883, but I wanted one of the the later editions (from the 6th edition on) because they contain two of Austin Dobson's bookplates as well as notes which weren't included in the first five editions. 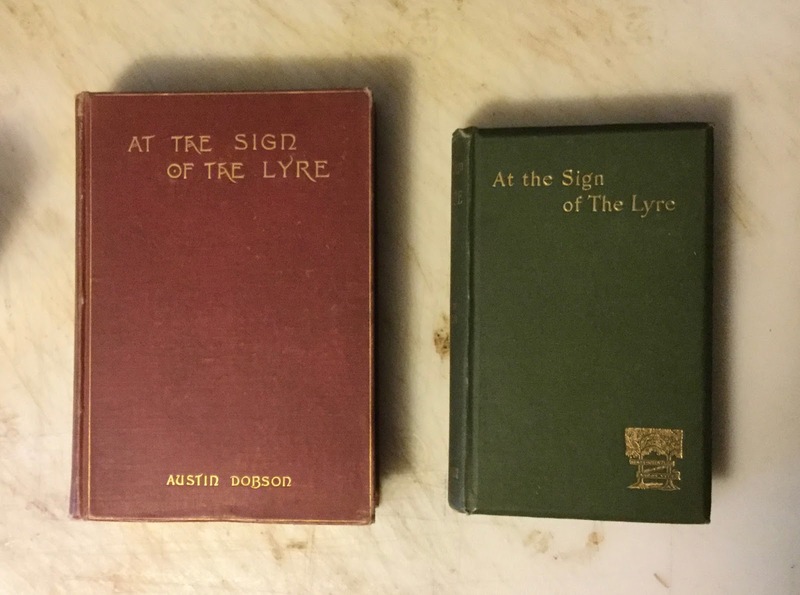 Both the First American Edition and the First English Edition of At the Sign of the Lyre pictured below were published in 1885. But the American edition contains 13 pieces that were not included in the English edition. I have the 1885 First American Edition. But the English edition I have is the 1890 eighth edition. And I have the later edition of At the sign of the Lyre for the same reason I have two copies of Old-World Idylls. 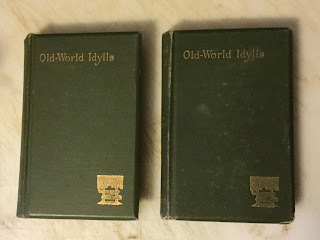 I actually need a second copy of the English Edition of At the Sign of the Lyre, because–and you're not going to believe this–when combined with Old-World Idylls, the two volumes are identical to volumes one and two of Poems On Several Occasions. 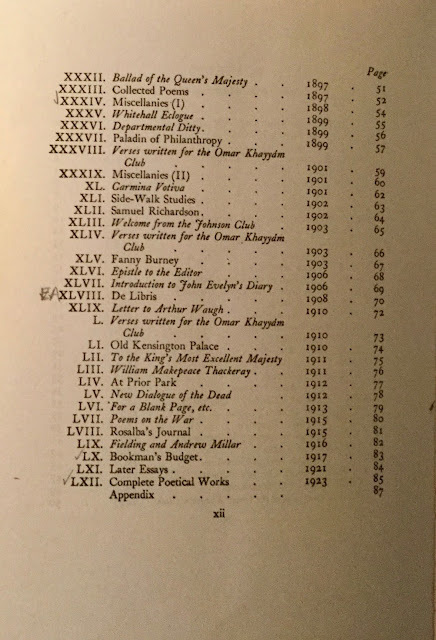 In fact, title pages and half-title pages are provided in the last pages of At the Sign of the Lyre just in case you want to change the titles of the books! 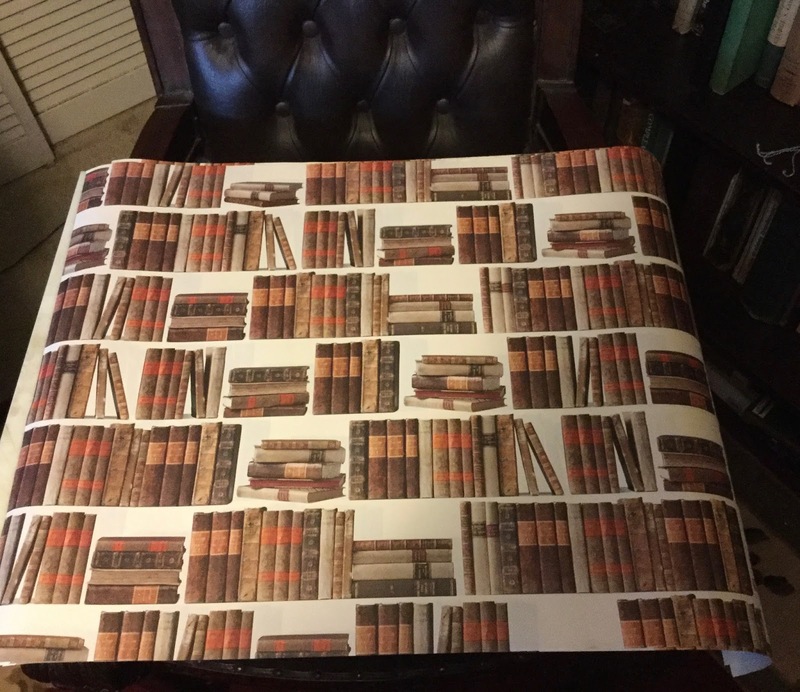 That would definitely confuse a book collector! To see a different title on the title page than the title on the cover of the book! Do you remember William Chambers Parke, the former owner of my copy of the first English Edition of Vignettes in Rhyme? He was the former owner of my copy of the 1890 eighth edition of At the Sign of the Lyre. 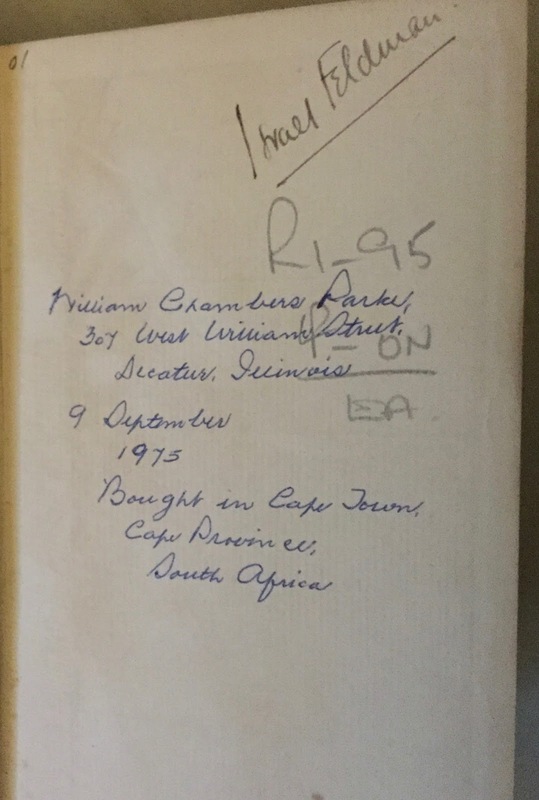 And he bought it in Cape Town, South Africa in 1975. 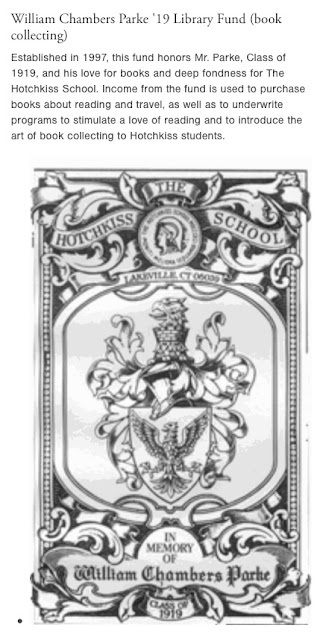 A side note here: William Chambers Parke was a graduate of Hotchkiss School in Lakeville, Ct. And an endowed fund was created in his name to support book collecting! The 1892 "First English Edition" of The Ballade of Beau Brocade technically isn't a "first edition." 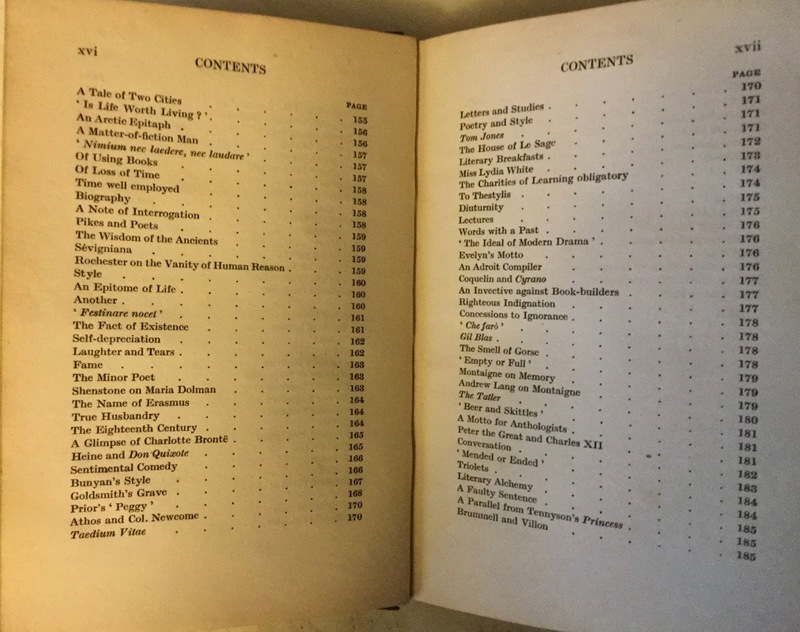 Every piece was previously published in two other books. 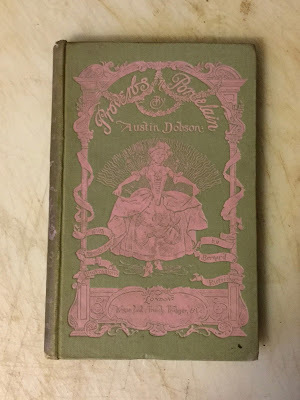 I also have a 1903 edition of the Ballade of Beau Brocade, which "surprisingly" contains the same eight pieces as the 1892 edition. 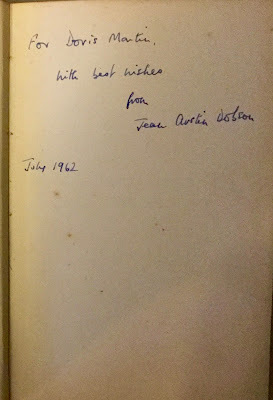 Austin Dobson's granddaughter Jean Austin Dobson gave this copy of the book to a Doris Martin. 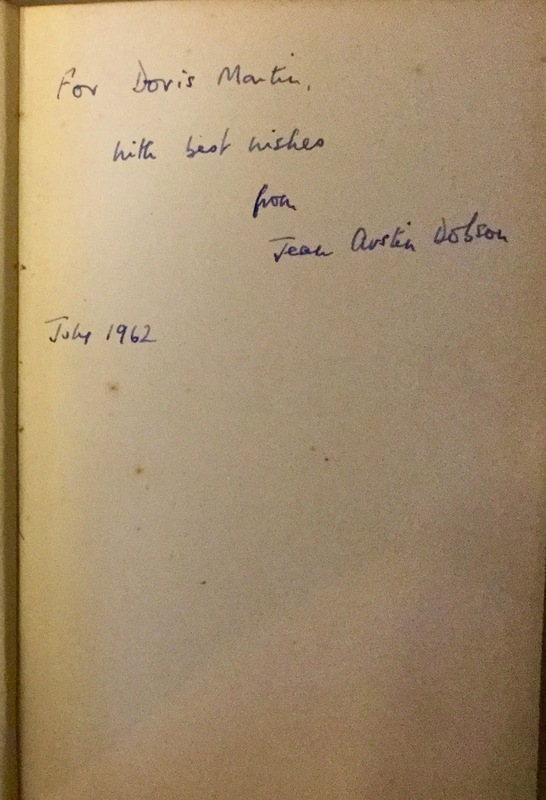 Last I heard from her friend Colin Hurrell a few years back, Jean Austin Dobson was still reading her grandfather's poetry. My California friend Asta Beckett gave me this book as a birthday present in 2007. 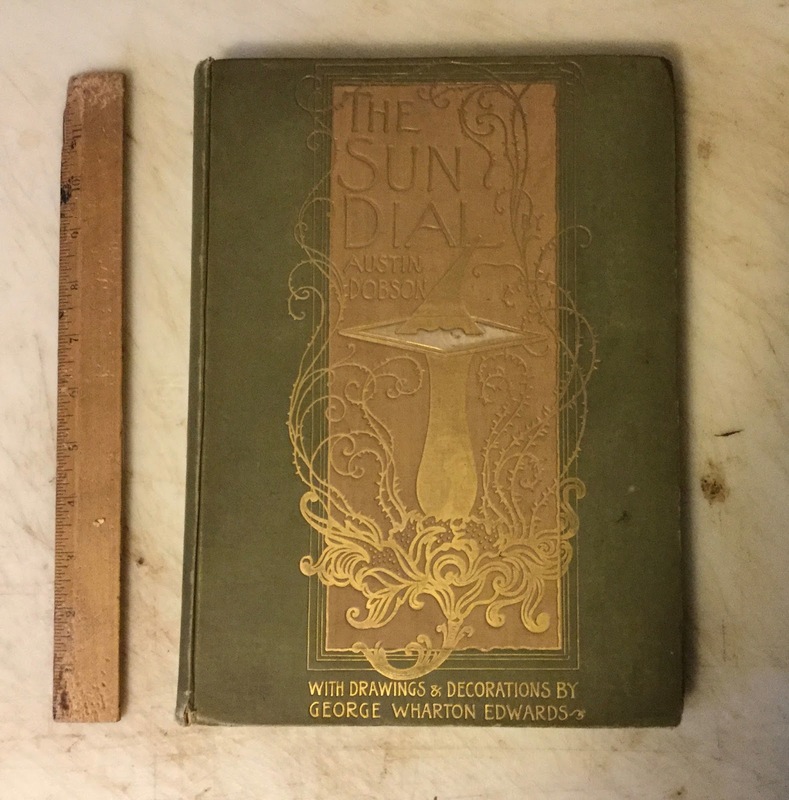 An impressive-looking book in my A. D. collection is my copy of the illustrated edition of The Sun Dial published by Dodd, Mead and Company in New York in 1890 (cloth cover, not vellum). The poem, "The Sundial," was reprinted in Dodd, Mead and Company's 1895 edition of The Story of Rosina. The First English Edition was published the same year by Kegan Paul. 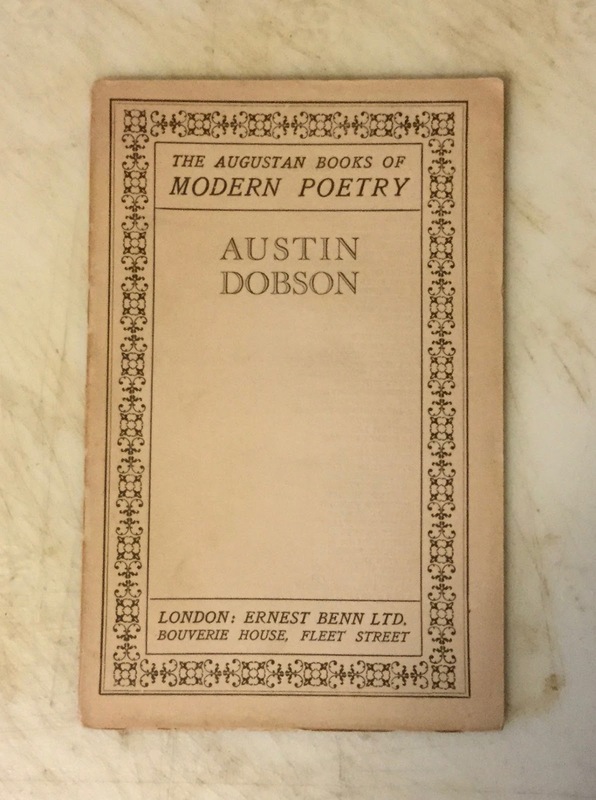 Trench, Trubner and Co.
Austin Dobson was included in The Augustan Books of Modern Poetry, a series edited by Edward Thompson in England in the middle to late 1920s. 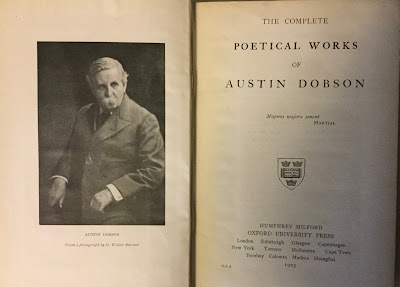 Thompson provided a short summary of Austin Dobson and actually introduces the last of my Dobson poetry books: The Complete Poetical Works of Austin Dobson, first published in 1923. I shall not question or reply. 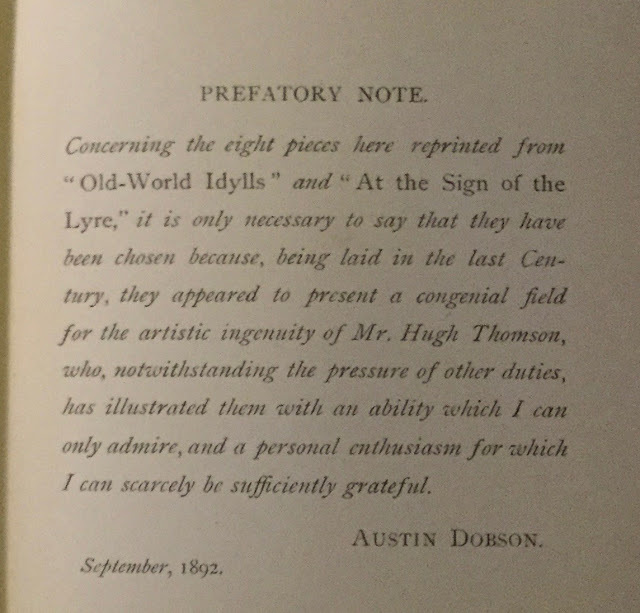 Andrea Cawelti, Ward Music Cataloger, Houghton Library, Harvard University, was kind enough to share some snapshots of a unique Austin Dobson item that her library has: a manuscript containing a gathering of leaves of 18th century songs and dance figures that Austin Dobson collected. A listing of all 205 leaves can be viewed here. Below are images of the cover, "title page depicting Dobson's bookplate," preliminaries, and a few examples of the music clippings. Thanks Andrea!